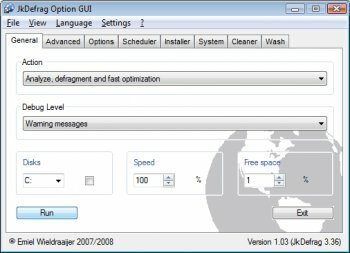 JkDefragGUI is an Graphical User Interface which allows you to easily select all the features JkDefrag, a freeware defragmentation tool made by Jeroen Kessels has to offer. JkDefragGUI can schedule a defragmentation, install JkDefrag or it's screensaver but can also do some small maintenance to your computer. It can be used to schedule a defragmentation of your systemfiles like pagefile and registry files. I thought JKDefrag was replaced by MyDefrag ? What's to point for this GUI then ? Good UI for a great defrag tool, highly recommended over Windows built in defrag tool. One of the first things I install on several XP/Vista boxes. No frills but effective. The best JkDefrag GUI for the best disk defragmenter! With the development over the years it has become the ultimate tool for optimizing your system. Defragment, cleaning of personal data, disk wiping and scheduling. This is the best of the GUI's for the best defragger.